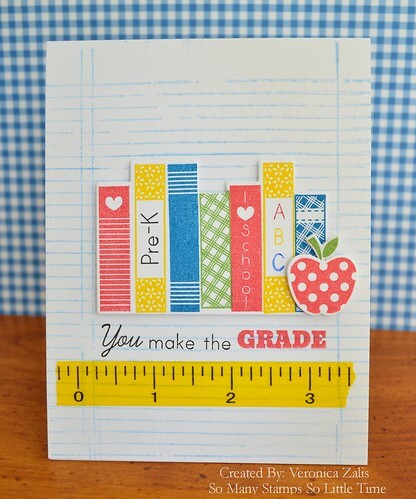 So Many Stamps So Little Time: You Make The Grade! I finally had a chance to make a card "just for fun" and I was happy to use my new Papertrey Ink stamp set "Back To School". This set and matching dies is SO cute, and since I have a sister-in-law starting her first year as a pre-k teacher I thought it would be fun to make a card especially for her. The yellow ruler is washi tape that I found at my local Wal-Mart for .97. It is SO cute! I'm happy you stopped by and I hope you have a great day! wow this is so awesome.. i love it..
such a cute card!!! hope moving is going smoothly for you! So cute, love teaher/school themed cards!!! ...and design is very similar to the Case(E) this sketch sketch ..